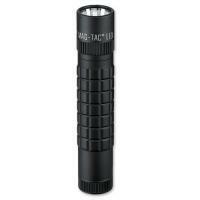 The MAG-TAC® LED flashlight series includes the Plain Bezel LED Tactical Flashlight, a compact light for officers on the go. While this model was designed specifically for law enforcement personnel, its truly portable frame makes it well-suited for the average civilian. The plain-style bezel offers a simple and streamlined look. Use the tail cap switch and MAGLite's trademark Quick-Click™ technology to select between one of three modes of light output: full power for the deepest darkness, power save to conserve battery life, and momentary-on for manual on and off functioning. Convenient carry of the flashlight is made possible with a detachable pocket clip.